Boulder County / Safety & Law / Victim & Witness Support / Restorative Justice / What is Restorative Justice? Restorative Justice is both ancient and new. It was practiced in communities around the world before laws were written down. Yet communities like ours are still learning about it. “Restorative justice is a process to involve, to the extent possible, those who have a stake in an offense and to collectively identify and address harms, needs and obligations, in order to heal and put things right as possible.”- Howard Zehr, PhD. Crime creates harms, needs and obligations. If crime upsets the balance, and results in actual harms and needs, then who should be primarily responsible to restore that balance? Individuals most affected should be meaningfully included and empowered. If John broke into Ms. Jones’s home, we should ask Ms. Jones what she wants and needs from the process. Restorative justice can take place in many kinds of cases as long as there are willing participants and a safe environment. 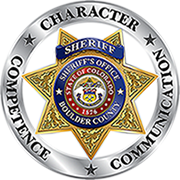 Boulder County Sheriff’s Office Restorative Justice receives referrals for adults and youth who are facing criminal charges for both felonies and misdemeanors such as (but not limited to) shoplifting harassment, theft, providing false information to authorities, identity theft, criminal trespass, burglary, possession and disorderly conduct.